The Death Valley national Park is situated in the American states of California and Nevada. It is composed of two principal valleys; Death Valley and Panamint Valley and is one of the hottest and driest places in North America. Its area covers 13,500 km2 and hosts various types of ecosystems as well as a wide variety of plant life and wildlife. There are over 400 species of wildlife and over 1,000 species of plant life present here, 23 of which are endemic. 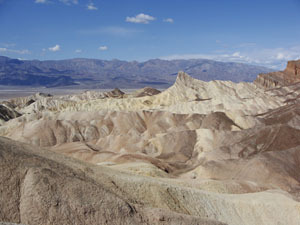 There are numerous places of interest in Death Valley; Artist’s Palette with a variety of colours in its rocks due to the oxidisation of metals in the latter, Badwater and its salt pans situated at 86 metres below sea level, the magnificent panorama of Dante’s View at an altitude of 1,676 metres, Golden Canyon with its geological formations and, in the background, the red cliffs of Red Cathedral and the ghost town of Rhyolite, abandoned since 1907 after its heyday during the gold rush years. There are also the Sand Dunes that crackle as they move slightly with the wind, and there is also Scotty’s Castle in the middle of its oasis. For accommodation, the only establishment that exist in the park are at Furnace Creek and Stovepipe Wells although camping sites are scattered around the park at a number of places, these should however be avoided during the hottest season.